Steve graduated from McNally Smith College of Music in 1993. 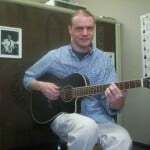 He has performed professionally and been a teacher for 21 years. During that time Steve has taught not only individual lessons but also worked as an instructor within the Anoka-Hennepin School District, Girl Rock-N-Roll Retreat (girls rock camp) and the Kid-U program at Anoka-Ramsey Community College. Steve believes that each lesson should be individually tailored to each student's needs and goals, based on musical ability and stylistic preferences. Steve is well versed in every genre of music, including blues, rock, jazz, country, pop, classical, hard rock, punk, heavy metal, R&B, classic rock, swing, etc. Steve currently performs with renowned vocalist Kathleen Johnson and BKS (Best Kept Secret). He has appeared on stage with or opened for Jimmy Vaughn, Scott Holt, Big John Dickerson, Barbara LeShore, Bernard Allison, Big Walter Smith, Jimmy Prime Time Smith, Tim Obrien, and many others.